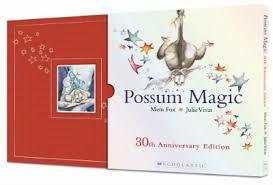 Possum Magic is one of the best selling picture books in Australia. It is an enduring classic which this year celebrates its 30th anniversary. Possum Magic is the story of Hush and Grandma Poss who live happily together in the Australian bush. Grandma Poss makes bush magic and her best magic is the one which makes Hush invisible. This provides the little possum with not only amusement, but safety as well. The problem begins when Hush wants to know what she looks like and Grandma Poss cannot find the magic which will make Hush visible again. So Hush and her grandma travel around Australia tasting classic Aussie foods. They eat ‘Minties in Melbourne’, ‘pumpkin scones in Brisbane’ and keep tasting through cities until the possum’s body begins to appear. Possum Magic is a wonderful book. The text and illustrations weave seamlessly together and there is a magical quality to the story which endears it to children and adults everywhere, placing it firmly in their hearts. This 30th anniversary edition is a stunning book - cloth bound with a slipcase - it would make a wonderful gift. The front cover is red with a beautiful small illustration of Grandma Poss reading at night to the invisible Hush, who is peering over her shoulder. It is a simple classy cover for a classic book. This edition will only be available during 2013 and deserves to be on every child’s bookshelf.